Friday night saw these dainty little pair of anklets cast off. They are the third pair of socks to count towards the 26pair plunge. 26 pairs of socks to be knit by the end of next June, or at least that is what I’ve challenged myself to!. These pair are for Elizabeth. I called these socks Fruit Salad as they reminded me of the penny sweets of the same name I got when a young girl. 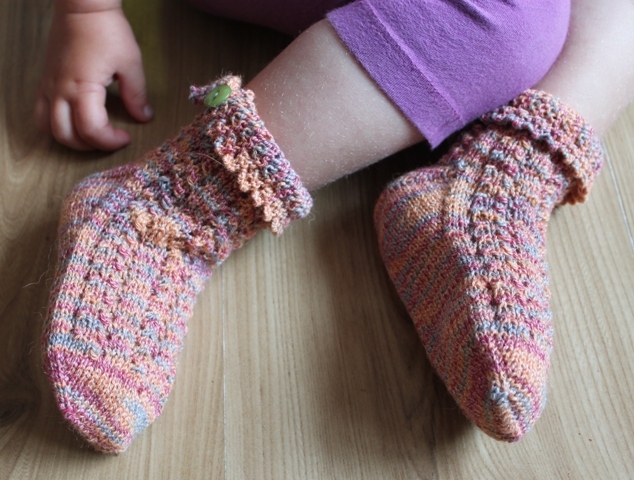 They are the dainty anklets that are featured in the Wendy D Johnson book Toe Up Socks for Every Body. 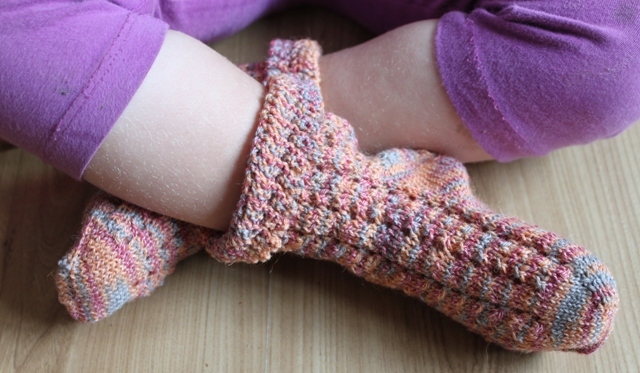 The leg and front of the foot of these have a lovely lace pattern and the cuff is a lovely addition and sets it off perfectly. Elizabeth is in between two sizes on these with her foot measuring the width or nearer to the width of the medium size but the length of her foot is nowhere near the length stated for all three sizes. So on the first sock we measured several times and adjusted the length accordingly. With the result we have a sock that fits her just fine yet will see her through the winter. This is a pose Elizabeth is known for among the family and the girls in particular. When showing off shoes or indeed socks now she turns her foot just perfectly to show to best advantage. Nobody has shown her it just comes natural. I’m not sure how it does to a three year old but it does ! As you can see we chose a lovely lime green contrasting button to add to the socks. This I love and we spent a happy half hour rooting through the button box to find buttons we liked. Again she had such fun modelling these off and as a model will twist and turn to suit. I knit these on 2.5mm needles and used a yarn by NinaNinocska. She is really looking forward to getting to the autumn and wearing these. I am pleased though with how the fit turned out and it’s the first time I’ve altered the pattern to make sure it fits who I’m giving them to. 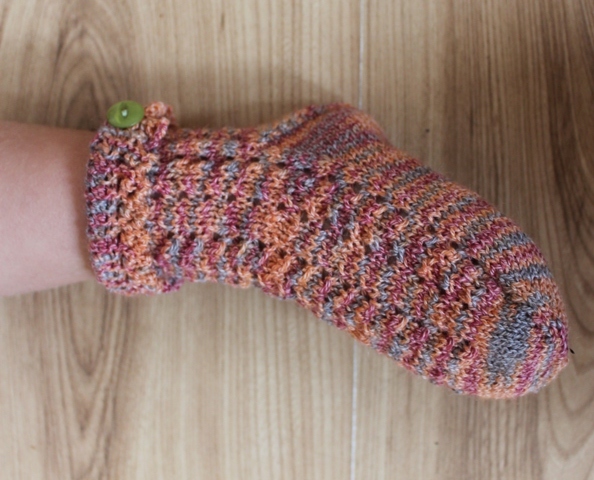 These are the third pair of toe up socks and I’m slowly coming round to liking that method. Would I favour it over cuff down socks ? For the children I think I would, it’s easier to get a sock that fits their foot. I guess really both have advantages and disadvantages. 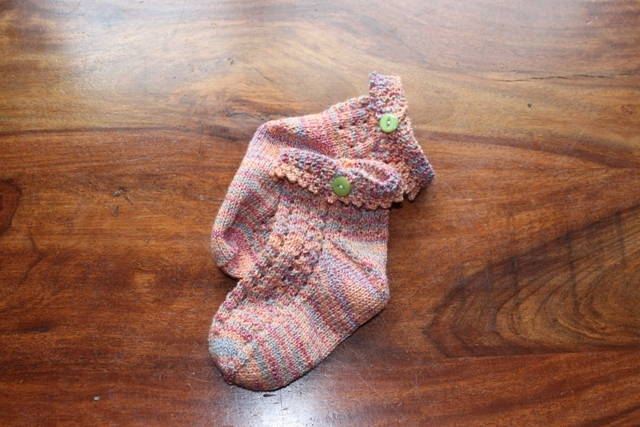 This entry was posted in Finished object, Knitting and tagged Anklet, Fruit Salad Socks. Bookmark the permalink. 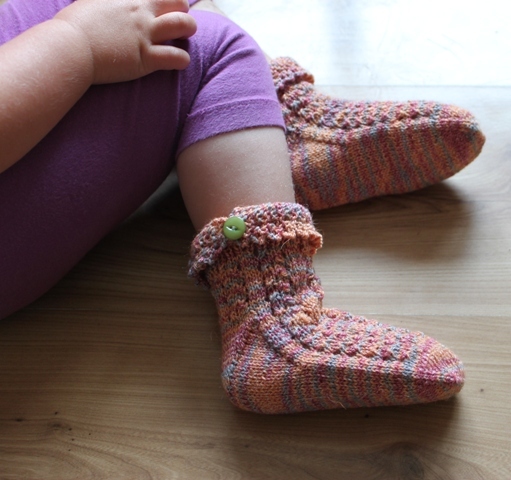 It is a cunning art trying to knit socks for little ones as you want to include some growing room otherwise they only seem to fit them for 5 mins, Elizabeth has mastered those sock modelling poses, they look lovely on her and should keep her little toes cosy this autumn. On another note I’ve had some problems leaving comments on wordpress blogs, and it seems the e-mail addy I was using is the same one I used to use on wordpress before. Anyway I’ve created a new e-mail and I’m hoping it works on blogger. I’m hoping I got the balance right with growth room and fit now but we shall see, hopefully as you say they will keep her toes toasty this autumn and winter. So sweet – I love them! 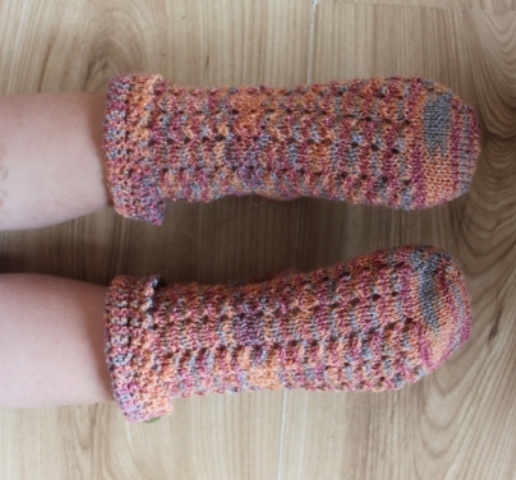 It is sometimes hard to get the fit just right with childrens socks, your little one makes a very good sock model, it looks like she’s really proud of her lovely new socks. 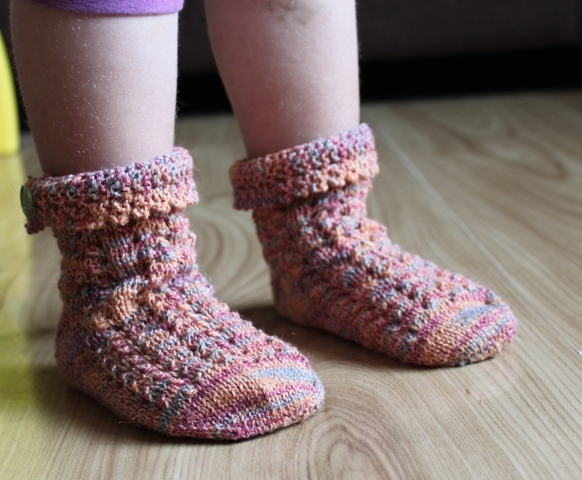 Well seems as if you have a foot model in the family….all the poses just made me smile…very sweet socks…. Oh her little foot pose is darling. These are sweet socks. I think this technique really suits my feet. I still want to try different heels but I don’t know if those are for cuff down. Sweet! 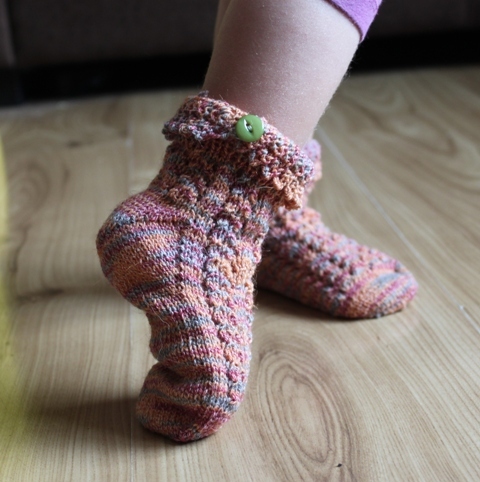 Her little foot poses are really cute–When I get around to doing socks, (ahem…this year, I promise) I will start toe up. That method just seems to make the most sense to me. Well done Ruth. You are on your way to meeting your goal! Congrats on the great pair of socks. I love the color. Your daughter makes a great foot model. Sweet socks, and the colour.